Monday saw the first day of main draw action on the second week of the East Africa Junior circuit under-18 tennis championship where a mixed bag of results saw some Kenyan casualties in the opening round. The top 16 players were not on court in the boy's draw. Therefore, top seed Kenya’s Sheil Kotecha had a well deserved breather after his exploits in the first week. Kotecha joined an elite group of only three other Kenyans who hold the title of ITF under-18 champion when he won the boys' singles. On the court, Kenya’s Ryan Randiek overcome a tough first round battle against Uganda’s Boris Aguma. Randiek dropped a first tight set to Aguma, 5-7 before fighting back in nail biting fashion to square the match with a 6-4 second set victory before finally coming through 6-3 in the third and deciding set. Another Kenyan, Albert Njogu was however an opening round casualty, losing to Great Britain’s Matthew Beecher in straight sets 3-6, 1-6. Njogu was a recipient of a Wild Card entry into the main draw but failed to live up to expectations in the one sided affair. Kevin Cheruiyot fell two spots in the seeding and ranks third from his week one ranking of 1. Cheruiyot will be hoping to exorcise the ghosts of his below par performance last week when he opens his account today (Tuesday) against Rwanda’s Fabrice Tuyishime in a potentially tricky encounter. 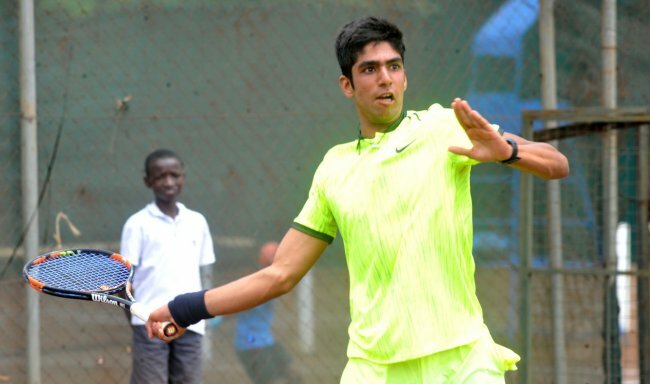 Kotecha rounds up the group of four Kenyans in the boys' main draw. He plays his second round match against Serbia’s Oliver Jevtovic where he will be hoping to win his second singles title in as many weeks. In the girls' draw, Kenya’s representatives found the going a bit slippery on the courts at Public Service Club. As the only Kenyans on the draw, Faith Omurunga Nyabera and Sneha Kotecha gave their all in their matches but came up short. Sneha Kotecha faced Ukrainian Oleksandra Balaba in one of the most tightly contested matches of the day. Kotecha won the opening set 6-2 with relative ease before coming unstuck and losing the second set by a similar margin. The decider was a tough affair, going the full distance and had to be settled in a tie break which just eluded Kotecha, she lost it 11-9 to fall out of the main draw singles. Kotecha’s compatriot, Omurunga also had a tough match against India’s Trisha Vinod. Theirs also was a three set contest which saw two sets decided on a tie break before the final set decider. Omurunga faded in the third to see Vinod take the victory and a spot in the second round, final score 6-7(5), 7-6(5), 6-1 in favour of the Indian. Girls' Singles: Celestine Avomo Ella (1) (GAB) beat Wiktoria Novak (Poland) 6-0, 6-0. Elena Gemovic (Serbia) beat Bhakti Parwani (India) 6-2, 6-0. Lara van der Merwe (South Africa) beat Olive Tuyisenge (Rwanda) 6-0, 6-3. Danisa Amalia Erriad (INA) beat Evelyn Kwizera (Rwanda) 6-2, 6-1. Daevinia Achong (Netherlands) beat Scarlett Hutchinson (Great Britain) 6-1, 6-1. Oliver Jevtovic (USA) beat Stefan Gazo (Serbia) 7-5, 6-3. Mann Shah (India) beat Francesco Denicoloi (Italy) 6-3, 6-3. Gijs Akkermans (Netherlands) beat Harry Thursfield (Great Britain) 6-1, 6-2. Ernest Habiyambere (Rwanda) beat Jamie Davis (South Africa) 6-3, 6-3. Etienne Niyigena (Rwanda) beat M Sawami (Pakistan) 0-6, 7-5, 7-5. Yabsera Woondwesen (Ethiopia) beat Shabani Kabura (Burundi) 6-4, 6-4. Rithvik Bollipalli (India) beat Khololwam Montsi (South Africa) 6-4, 6-1. Lorenzo Rottoli (Italy) beat Harris Irfan-Ul_Haq (Pakistan) 6-0, 6-1. Fabrice Tuyishime (Rwanda) beat Aryan Zaveri (India) 2-6, 6-3, 6-3. P. Schwieger (Namibia) beat Lethabo Malope (South Africa) 6-1 6-2.